I can hardly believe my final week at work is already upon me. It’s a cliché, I know, but time really does fly – not so sure about the ‘when you’re having fun’ bit, but hopefully that’s still to come. This time next week, quite possibly, as I recover from this weekend’s 16 mile Wholefoods run in style with a trip to the Big Apple to visit the girl I affectionately call my ‘spiritual twin’ (so named after the two weeks we spent helping each other cling to our sanity in an ashram in southern India in 2011). After the events of the past few weeks a holiday is just what the doctor ordered, and I’m very much looking forward to taking some time out to reflect on the imminent changes in my life (not to mention start tackling the enormous writing-related tomes I’ve purchased in preparation for going freelance). The plan, thus far, is to sip coffee, nibble (oh alright, scoff) cake, down wine and eat inordinately large amounts of CHEESE – with a bit of sightseeing and a LOT of nattering thrown into the mix to boot. In short, we’re going to set the world to rights one mouthful at a time and I cannot WAIT. Because of all the recent changes in my own life it’s no surprise that I’ve been ruminating on the nature and importance of change as a life driver. Should we, I wonder, embrace it regularly as a way to rejuvenate ourselves, or should we rather seek out a more preferable state of equilibrium, in which we can be happy to see out the rest of our days? At the moment I’m inclined to think the former, not least because of this article I remembered having read a few years back about how the brain perceives time. The article discusses the central concepts of a book, Making Time, written by Steve Taylor. In it, he claims that as we get older it seems as though time is speeding up, but that’s only because we fall into hum drum existences and get caught up in the same old cycle, day in, day out. If we seek out new experiences – for example by filling our weekends with trips to art galleries, coffee in kitsch new coffee houses and lunches and dinners in new locations with friends and family – then our perception of time actually changes and we view it as having passed more slowly than it actually did. It could be argued that this is counter-intuitive, since the sensation of being bored often feel s as if it spans a lifetime, but if you stop to consider how fast the last five years have gone since you joined your current company you might begin to give credence to the idea. It seems a pretty compelling argument to me. Now where DID I put that passport….? 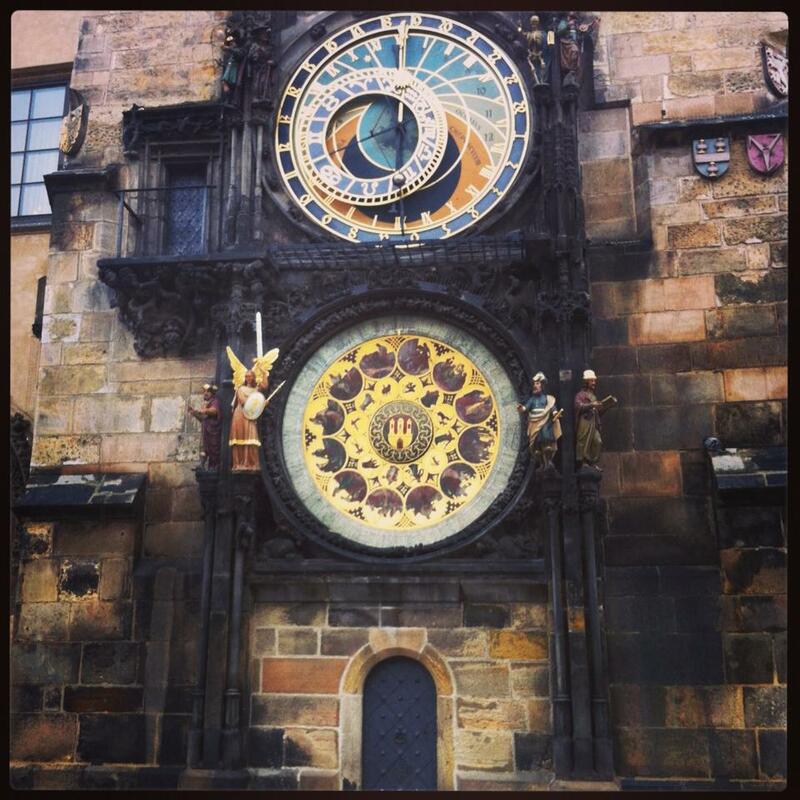 I fell in love with this clock in the main square of Prague’s old town. It looks like a time machine! This entry was posted in Uncategorized and tagged big apple, boredom, cake, change, cheese, coffee, excitement, holiday, making time, new experiences, new york, perception, steve taylor, time, wine by Belle365. Bookmark the permalink.